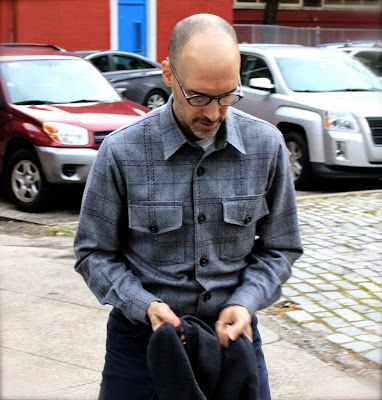 I sewed a wide variety of garments in 2014 -- I didn't realize how much I'd sewn till I sat down to prepare this post. 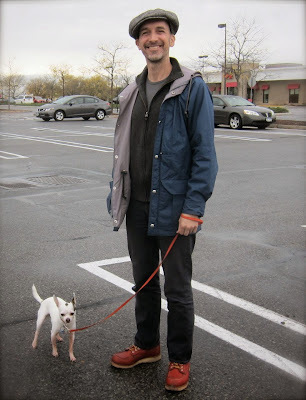 My mountain parka (up top) has seen the most use for sure; it's my go-to jacket/coat when the weather is above freezing. 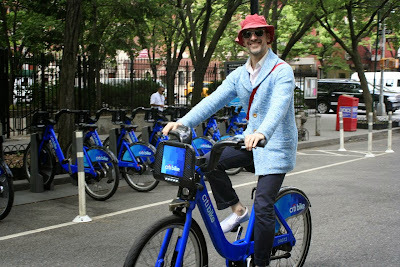 I travel around town a lot by bike these days and this parka is perfect for cycling: it breathes, it's lightweight, it's great for layering and it's waterproof. Plus, it has a two-way zipper. I love it. 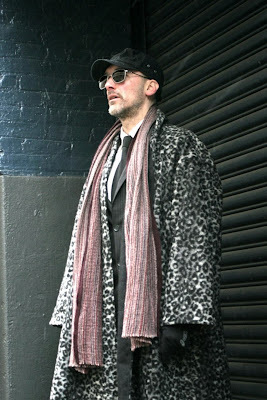 It seems like I made my leopard-print wool coat (below) a lifetime ago. I'm wearing it tomorrow night for our New Years Eve festivities! 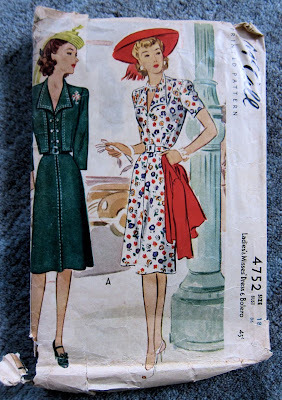 My cousin Cathy got only one dress this year but it's one of my all-time favorites: a 1942 McCall's pattern I whipped up in vintage rayon crepe! 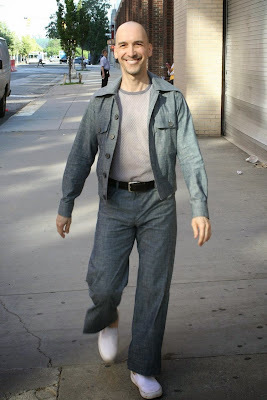 One definite dud: Michael has dubbed the collarless, pastel, short-sleeve shirt below the Dorothy Zbornak for its Golden Girls palette and Eighties fit. Hey, nothing ventured, nothing gained! I invite you to tune in and find out, and as always, to kick off your shoes and stay awhile! Happy New Year, everybody -- best wishes from my family to yours! You made some beautiful garments this year. :) I look forward to seeing what 2015 brings! I agree, I too am excited to see what amazing things you create next year. 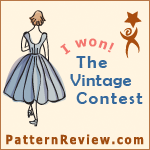 I'm looking forward to 2015 with MPB sewing inspirations. The look back makes me wonder what WONDERS we will behold in the coming year. Sew on, Peter. All your makes are terrific. 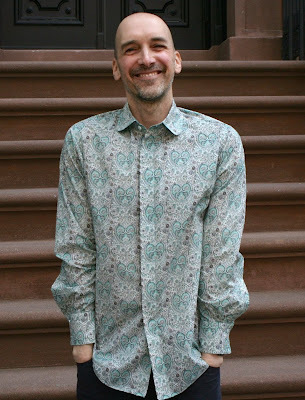 I especially love your shirts - beautiful, whimsical, and fun fabrics! Peter - I love all your posts!! 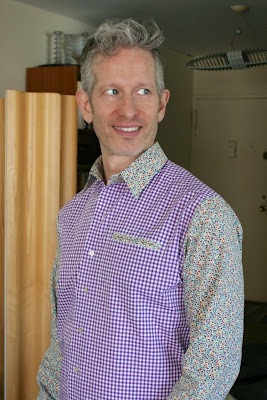 I love shirtmaking too, and regularly make shirts for my DH and one DS. 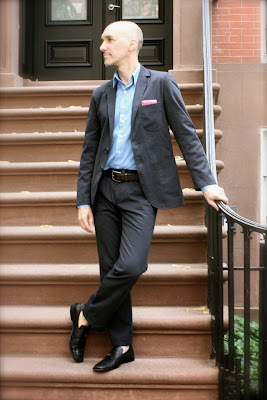 Am planning a topcoat and dress slacks for my DH in 2015, and will come back to review your thoughts on these garments. 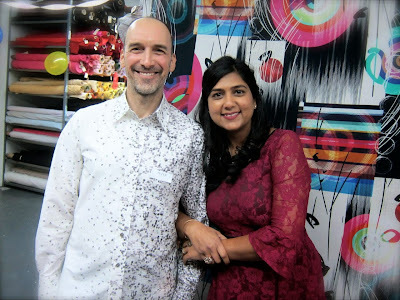 Here's wishing you a great 2015, and even more sewing joy!! 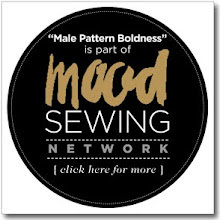 You and MPB add so much to sewing, and frankly, the Internet. Eager to bear witness to all of your 2015 antics and episodes! Best wishes to you and yours. Looking forwarding to seeing what's in store at MPB in 2015. Wowee!!! 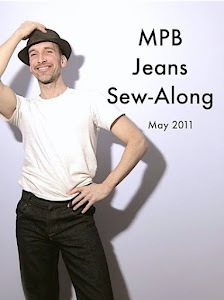 A prolific year for sewing at MPB. I'll admit that I have a few favorites but I don't think there is a single dud in the whole bunch...even the Golden Girls top! You are an inspiration! Very impressive, you have been busy and you've done a great job. 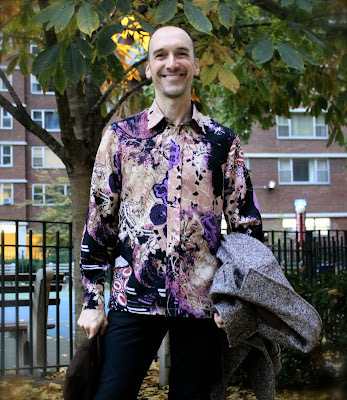 You are the one person to find a good layout for "Home Sewing Is Easy", and Cathy's rayon is divine! Thanks for the inspiration and all the best for the new year. 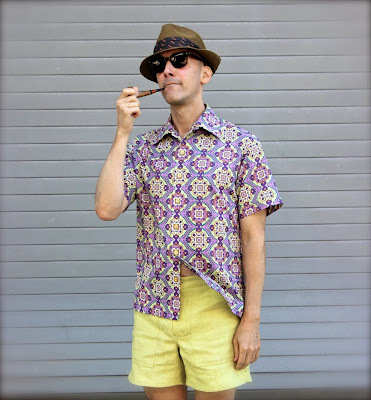 That side-print shirt is my absolute favourite, looks superb, very clever. Also have got hold of that green pepper anorak pattern on the back of your posts about it (think you pull that fabric off well too), intend to start on it in the new year. So thanks! Thanks for making the world a MUCH more interesting place! 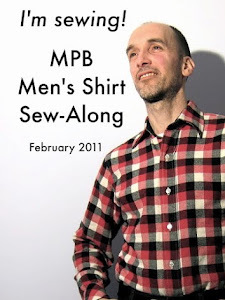 I know I'm not the only person who'd be lost without MPB. Looking forward to seeing all you create in 2015. 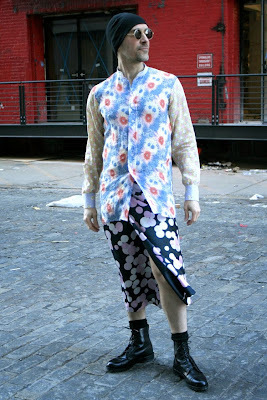 The pattern-mixing outfit (Asian street) is still my fave. I LOVE it. And Michael really named that last one aptly. Hilarious. 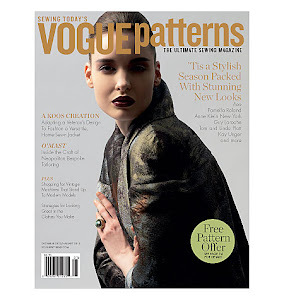 Aaaaaagggggghhhhh, I'm still lusting after that leopard-print coat! It's so good! All the best to you and Michael in 2015! Can't wait to see what you get up to in the new year! That wool challis is still my favorite (and you look damn good in it) but you've made so many great things; such a retrospective is something anyone would be proud of. I'm looking forward to 2015 at MPB because I'm never sure what's next and I always enjoy the ride. Peace, productivity, and prosperity to all. Love all your makes and the pics that accompany them. All the best for 2015 Peter and look forwards to seeing your latest creations. Happy New Year to you and Michael! You're going to need that coat tonight, that's for sure. You made some really wonderful garments this year and I agree your shirts are something to be proud of, a terrific output. I'm jealous of your fabric sources. I haven't seen wool crepe or challis in years. Ditto every other good fabric known to mankind. Fabulous things - look forward to 2015 - Happy New Year! Pretty darn good year of sewing. 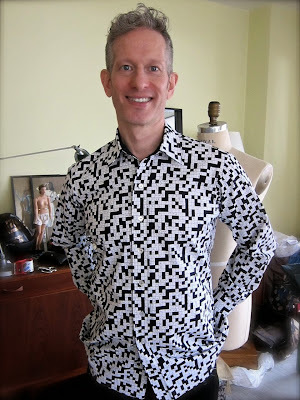 I'm mad for the cotton panel and crossword shirts. Poor Cathy. Maybe she'll have a better 2015. 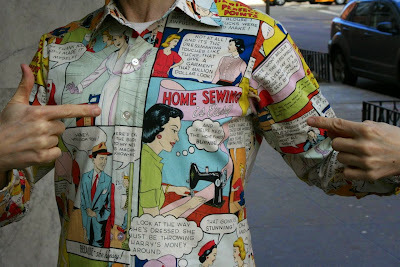 Wow, that Home Sewing shirt seems like eons ago....it was just this year? Happy New Year Peter and the gang at MPB Industries Inc! 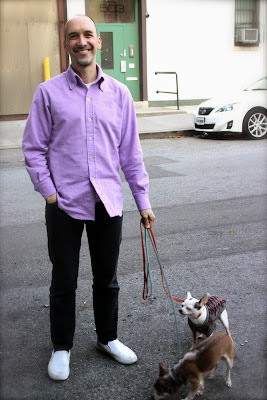 you've made me love you (wait a minute...), Michael, the doggies, your Mom, and, of course: everything you sew. thanks for helping me make it through the year. Peter, you have inspired me! 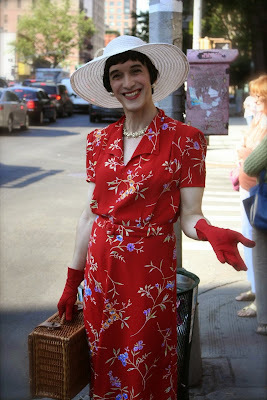 I opened up my machine and made my first dress in 15 years over the last weekend. 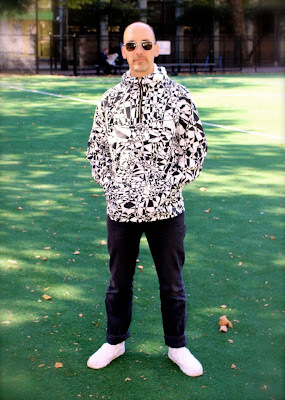 I so enjoy seeing all your fantastic creations (excellent in both design and execution) and reading your charming blog. And, just wait enough time...the "Golden Girls" shirt will, eventually, become retro cool. Like the Shacket best! Happy New Year! Happy new year! You've learned so many new techniques this year, and really branched out into lots of different types of garments. The song clip made me really miss your videos and singing, hope that you surprise us with more of that whenever you're in the mood. If you decided to teach a parka class, I'm driving up there. You're so talented, Peter! These are all so wonderful. Happy New Year! I just found you by searching "mens boxer brief pattern". I'm new to the sewing world and am amazed by your work. 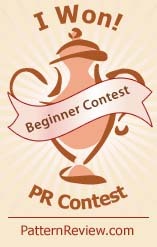 I look forward to following you and hopefully learning a few things. Happy New Year! Happy New Year! You sure made some fantastic garments in 2014. Must be an expert shirt maker now! 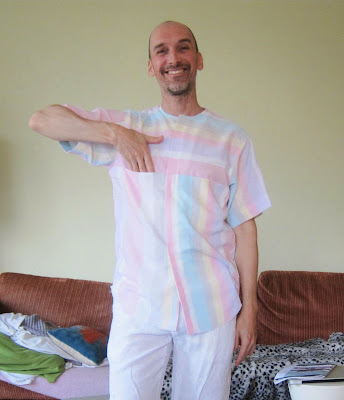 I especially love the dress you made Cathy and the Home Sewing shirt! Hopefully you can make even more awesome things this year! Wow! What a productive and inspiring year! Many amazing garments, but Cathy’s dress is my personal favorite. Thanks for being there to inspire us! And thanks for the lovely recording.